1The Yin and Yang, according to Chinese philosophy, are naturally occurring forces in the universe which in actuality not only complement one another, but are interdependent. 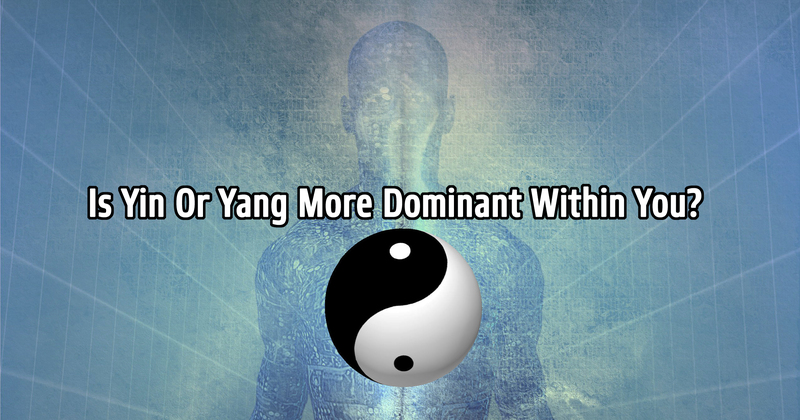 2Yin Or Yang What Is More Dominant Within You? 3Help Gostica raise the vibrations and SHARE this test with your family and friends. The Yin and Yang, according to Chinese philosophy, are naturally occurring forces in the universe which in actuality not only complement one another, but are interdependent. They actually come about through the process with which they are interconnected. It is their very opposition in the natural world that fosters the strength of their existence. This oppositional pull exists in each individual as we experience life. Recommended: Which Chakra is Blocking You From Living the Life You Desire? Take the Test NOW! The following quiz taps into the extent to which you balance the pull of the yin and yang that is naturally occurring in your encounters with the world. It is somewhat akin to what we describe as “Type A” or “Type B” personalities, or something in the middle. For instance, are you a fighter, a doormat or a kind person who is capable of standing up for yourself when it is appropriate? Are you self-centered or people-pleasing, or are you simply a generous person who has boundaries? This quiz will give you a sense of how balanced you are as an individual, or does the yin or yang pull you too hard in one direction or another? Yin Or Yang What Is More Dominant Within You? Help Gostica raise the vibrations and SHARE this test with your family and friends. I’m a fighter I speak my mind when needed,I’m kind as well that makes me?? I felt a pull to try this Yin/Yang test, first time ever doing this, very interesting. Again, psycho-babble. Do not any of you think c more than 2 brain cells? ?